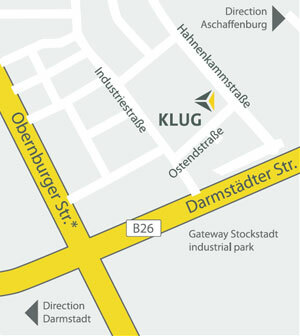 You find KLUG Fertigungstechnik in Stockstadt am Main, favorably and centrally located in Germany nearby Aschaffenburg. The motorway A3 is only a stone's throw away. Frankfurt am Main has only a distance of 40 km and Würzburg round about 80 km. At the Stockstadt exit, take the B469 towards Stockstadt. Take the second exit on the B469 to follow the B26 towards Stockstadt industrial estate ("Industriegebiet") and Aschaffenburg. Drive straight on towards Stockstadt and turn left into Industriestraße at the second set of traffic lights (start of the industrial estate). Then turn right into Ostendstraße. You will find us at the junction Ostendstraße/Hahnenkammstraße. The main entrance is on Ostendstraße. Here you can download our location plan as a pdf-document. Here you can view our location in Google Maps.